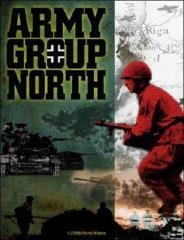 Army Group North covers the Soviet offensive in the Baltic and their drive toward Riga. It contains 300 counters, 2 maps and 2 scenarios (Strike for Riga and Operation Doppelkopf). Regiment & division scale, 6 mile hexes and 2days/turn. Uses an innovative movement system where proximity to an HQ determines how far subordinate units can move.